Orcutt Academy High School’s classroom No. 18 buzzed with the chatter of two groups of teenagers on either side of the room. Some worked silently on compact laptops, while others talked and laughed, or intently discussed various topics. It wasn’t the middle of the school day, but rather 7 p.m. at night. In the center of the room sat coaches, a couple of parent volunteers, and Ty Fredriks, the teacher and faculty facilitator of Orcutt Academy’s robotics team, the Spartatroniks. The students were in their own worlds accomplishing myriad tasks while Fredriks and his coaches discussed events coming up in the next few months. The students were busy programming software for the team robot on one side of the room, while the other group was making up business plans, Excel charts, and more, to help fund the team’s endeavors, Fredriks explained. There were also a couple of graduates of the program scattered among the students, explained Spartatroniks’ head coach Scott McLean. 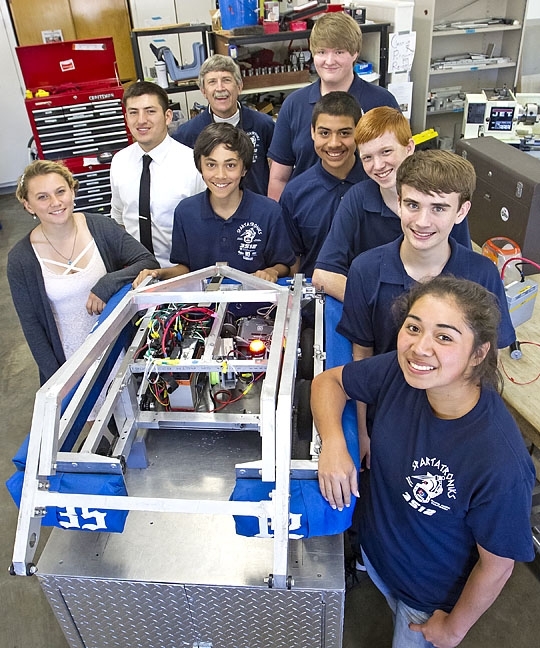 Orcutt Academy High School students Allison Fenske (left), Justin Zepeda (second to left), Charlie Parkinson (center), Joshua Hughes (center right, back), Christian Betancourt (center right, front), Dominick Brown (third from right), Luke Rowe (second to right), and Alexis Betancourt (front right) are all members of the robotics team, Spartatroniks, led by teacher Ty Fredriks (center left, back). “We have the graduates come back and mentor the high school kids, the high school kids mentor the younger kids, and the younger kids grow up and become part of our team again,” Fredriks said. 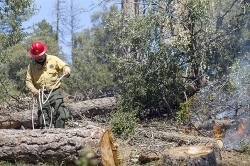 “That’s the whole goal, to work ourselves out of the job,” McLean said. “Hasn’t quite worked yet,” Fredriks added. The team was busy preparing for the Fall Classic, a practice tournament at Valencia High School in Placentia, which happened Sept. 24. The practice tournament featured the same competition the team engaged in last year, which includes a unique set of tasks that requires cooperation with other teams while battling another “alliance” of high school teams. Getting the Spartatroniks there involves just about the same procedure the football team undergoes for a traveling game. But instead of helmets and pads, “they’re bringing along wrenches, computers, battery chargers, and stuff like that,” McLean said. “And a 120-pound robot,” Fredriks added. Spartatroniks is treated just like any other team activity at Orcutt Academy. The students compete at the varsity level and can letter for their participation on the team. There’s even a spirit rally when the team completes a new robot just before they go to compete. All of these competitions, which are open to schools with robotics teams, are hosted by FIRST. FIRST is an international youth organization that operates competitions tiered for several ages and grade levels. FIRST is an acronym meaning For Inspiration and Recognition of Science and Technology. The whole mission of the organization—founded by Dean Kamen and Woodie Flowers in 1989—is to inspire students to get involved in engineering and technology. It’s safe to say that the program has done more than just “inspire” the students to get involved. They are already quite involved. On the other side of the Orcutt Academy campus, in another classroom that Frederiks and his students call the “build room,” a group of teens were in a huddle, but around a shiny contraption with exposed wires and a glowing red light. 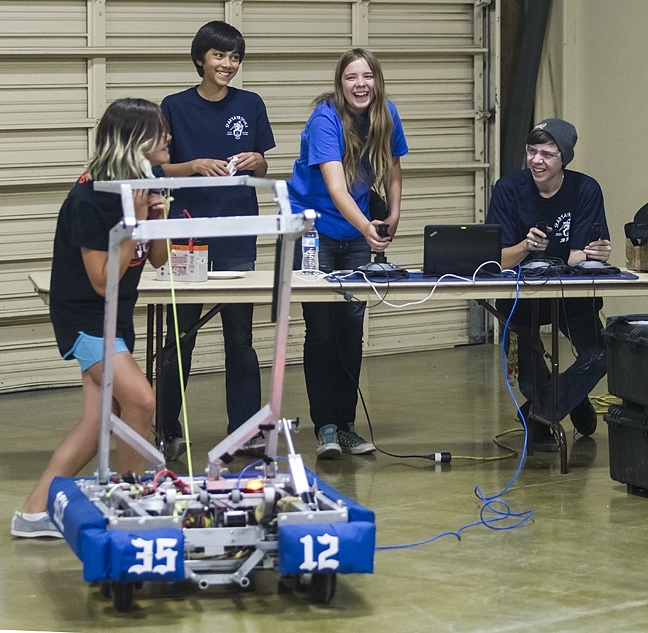 Orcutt Academy High School Spartatroniks hosts the FIRST Lego League Qualifying Tournament event on Nov. 12 at Lakeview Junior High School in Orcutt, where local middle school robotics teams will compete. More info: spartatroniks.com. Surrounding Parkinson and his teammates were all the hallmarks of a well-maintained machine shop. There are mills, lathes, ban saws, an industrial drill press, an electrical engineering workstation, and organized tool and supply bins. They are all machines and tools used in professional manufacturing, Fredriks explained. But there is also a workstation there that you wouldn’t see in the machine shops of just a decade ago. A computer sits right next to a boxy machine with a glass window on its door. It’s a state-of-the-art 3-D printer. Orcutt Academy senior Justin Zepeda is the “robot captain” for the team (he’s also one of the captains of the school’s football team), which involves overseeing the programming, building, and computer aided design of the robot. Computer aided design—CAD for short—is where the 3-D printer comes in, Zepeda explained, holding what appeared to be a spool of plastic wire in his hands. 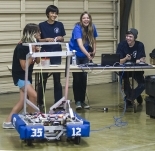 Most students involved in the robotics team do so across all four years of their education at Orcutt Academy, Fredriks said, and they work in several different departments of the team during those years. They can serve in different capacities such as electrical, mechanical, programming, or business and finances departments. Oructt Academy junior Allison Fenske has worked in several different capacities for Spartatroniks. Right now she’s the student tournament director for the upcoming Lego League regional tournament, but she’s done machining in the past for the team. She also plays on the Orcutt Academy football team as its only female player, a cornerback, and described the satisfaction that comes from completing a part for the team’s robot, named Cressida. Pre-high school robotics competitions through FIRST include Lego League, where a programmed Lego robot accomplishes several tasks. The Orcutt Junior High School Radioactive Mustangs (pictured) will compete in the FIRST Lego League qualifying tournament hosted by the Orcutt Academy High School’s Spartatroniks team on Nov. 12. Fenske, who is known as “Fenske 2.0” on the Spartatroniks team because her older sister is an alumna, is tournament director for the local FIRST Lego League (FLL) events. There was a FLL practice tournament on Sept. 25, and the FLL qualifying tournament is Nov. 12 at Lakeview Junior High School in Orcutt. The Lego League is FIRST’s division for grade school and middle school students. A new game is announced each year, and students have a few weeks to program their Lego robots to complete a series of tasks on a tabletop. Spartatroniks hosts the regional qualifying tournament this year, and Fenske is in charge of organizing all the people necessary to make it happen. Grade school and middle school robotics departments from across the Central Coast will converge on Lakeview Junior High School for the FLL qualifying tournament, Fenske and Fredriks explained. Judges will come from local aerospace companies, Vandenberg Air Force Base, and Cal Poly’s engineering department. Some are even alumni of robotics programs. 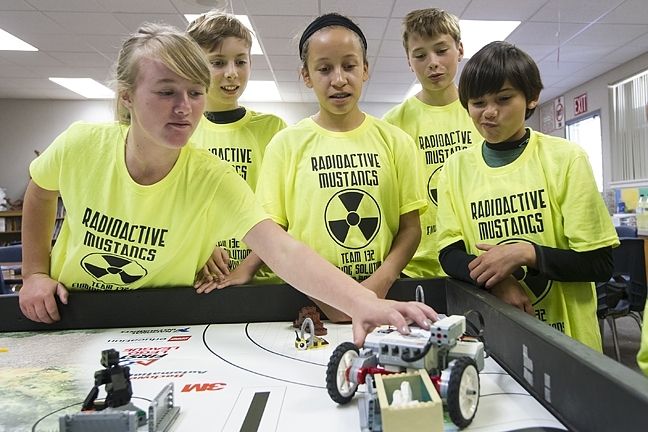 The Orcutt Junior High School (OJHS) team, the Radioactive Mustangs, will be there with its Lego robot. The team organized a demonstration of what will be going on at the qualifying tournament for the Sun in their classroom with teacher Ginger Fredriks (spouse of Ty Fredriks). Spartatroniks students collaborate to fundraise for their program, construct their robot, and compete at events across the state under the guidance of their teacher Ty Fredriks (pictured, center left). The table was decked out with various scenes or devices made out of Legos. They all had to do with animals in some way, said OJHS eighth grader Isabella Garcia, who explained the challenge. Each little scene, which involves everything from agricultural cleanup of bovine refuse to notifying support dogs of approaching vehicles at crosswalks, requires some interaction from the robot. The robot comes already made and is relatively simple, but it’s up to the students to program it to complete the tasks involved in the FLL challenge, explained OJHS eighth grader Kali Ballard. When asked if they wanted to continue on in robotics in high school and join Orcutt Academy’s Spartatroniks team (the two schools are next door) every student raised their hand. For some, robotics was a program they got involved in after seeing an older student or sibling on a team. 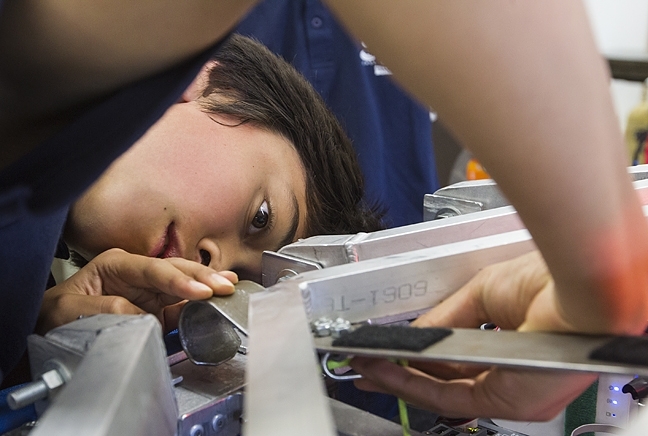 For others, robotics programs align with their interests and educational goals, like college. Orcutt Academy High School robotics students, including Charlie Parkinson, pictured, learn a variety of skills as Spartatroniks team members, namely programming, marketing, machining, electronics, and design. The Radioactive Mustangs enjoy a mentorship program with the Spartatroniks, just like the Spartatroniks enjoy the same from graduated alumni, some of whom attend Cal Poly or Allan Hancock College. The collaboration between the age groups does a lot to inspire the younger students to keep at it and to learn more. It also keeps a steady stream of students entering programs when they graduate from one school to another. Orcutt Academy senior Dominick Brown didn’t get involved in robotics until he came to the high school and joined Spartatroniks in his freshman year. But he got involved in mentoring, specifically with the Boys and Girls Club of Santa Maria Valley team. He explained that the FLL robots must complete their tasks autonomously, so programming is everything. FIRST’s high school level competitions begin the new season in January, when students all around the world receive a live-streamed announcement of the new game. They have six weeks to build and program their robot before they are competing in qualifying tournaments. The games involve several robots—last year it was three on each alliance—from separate school teams collaborating against another alliance of robots from other schools. As the games progress, winners get to recruit other teams’ robots and change their alliances, with the winning team going on to nationals. The six weeks from announcement to competition are intensive for the team, explained Ty Fredriks. The kids work hard and sacrifice a lot of time, but so do their parents. 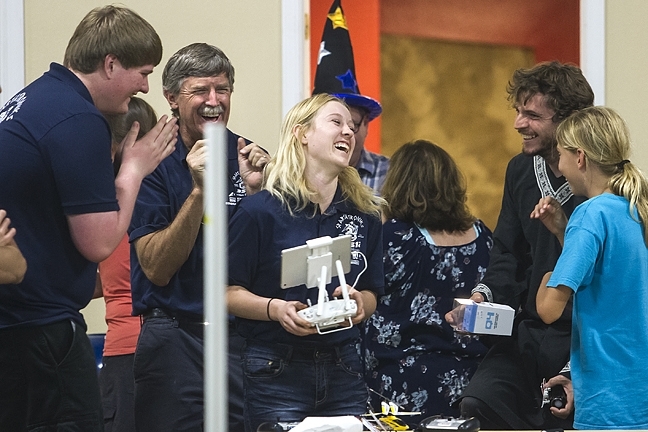 Orcutt Academy junior Fenske said that her parents “wished I was home more,” but that they support her in several ways with her involvement on both the robotics and football teams. She also said that her parents “see how much this is benefiting me.” She has learned several skills being involved in the team, from her machining skills to public speaking. The Orcutt Academy High School Spartatroniks team demonstrated their robot Cressida’s abilities at the eighth annual Softec Student Robotics Expo at the Madonna Center in SLO on Sept. 26. One way the parents pitch in is “team dinners,” Fesnke explained. The parents—including volunteer Enid Kelley-Oman, whose two sons have already graduated from Orcutt Academy and Spartatroniks—cook and prepare massive meals that the entire team enjoys together. Students like Fenske and Zepeda arrive at 6 a.m. to Orcutt Academy for football practice, attend school until just before 3 p.m., which is right around when a second football practice starts and runs until 6:30 p.m. After that, they are working with the robotics team, usually until 9 p.m. or later. Even though Zepeda is in his senior year, he’s still trying to learn as much as he can while there. He has already developed a lot of practical mechanical and electrical design skills on the team, but now as robot captain, he’s trying to learn programming as well, “which is like a whole language,” he said. This is all while serving as a captain on the football team as well.